Minister of State for Commerce and Industry C R Chaudhary on Tuesday lauded the role of Indian companies in Africa, saying they are forging new people-driven partnerships in the continent. "Indian companies are not only investing in Africa but are also forging new people-driven partnerships and creating jobs, which are impacting lives of common people in these countries," said the minister. Addressing the CII - Exim Bank -West Africa Regional Conclave organised on October 8-9, 2018 in Abuja, Nigeria, the minister appealed to all West African countries to avail of India's Duty-Free Tariff Preference (DFTP) scheme to increase their exports to India. He expressed hope that the conclave will open "a new chapter in India-West African economic relations." "The CII-EXIM Bank Regional Conclave on West Africa is happening at the right place at the right time to steer multi-dimensional relations between India and West Africa onto a higher trajectory," he said. 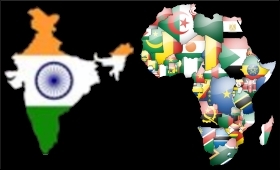 "West Africa is getting greater attention from India, both diplomatically and economically,” he said. He lauded ECOWAS for playing “the role of an enabler and catalyst in transforming economic fortunes of the region," the minister said.